From the mid-70s on, computer wargames were developed by the Operational Research Group of the TNO Physics Laboratory. Officers at the Higher Military School (HKS) received their first wargame experiences as part of their training with the SOLTAU computer model. First, the tactical decisions were entered into punch cards and the next day there was a new ‘situation’; a few years later SOLTAU could be run more interactive based upon terminal-input. SOLTAU calculated the outcomes of a simulated battle and also took the consequences of commands given by the players. Over the years, the use of the model outside the HKS increased. 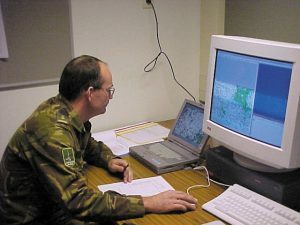 The Army Corps recognised the need for computer support of for, until then, the manually supported or completely unobserved command post exercises at battalion and brigade levels. 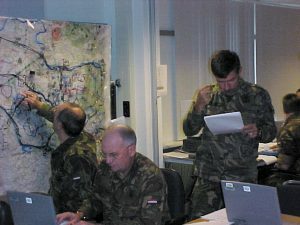 In 1982 as a result, the Royal Netherlands Army (KL) and TNO started a collaboration on the use of computer wargames in staff planning. In a command post or staff exercise, the player’s staffs (battalions and/or the brigade staffs) were in the field with their military equipment. These staffs had higher and subordinate commanders via radio stations connected to their hierarchy. In 1986, the development of KIBOWI started with a feasibility study. KIBOWI was a Command and Staff Trainer system that provided support for command post exercises at battalion, brigade and even division level. Since 1989, a KIBOWI prototype was used operationally and proved its positive influence on the results of the training. From 1990 on, KIBOWI was used in all battalion and brigade exercises in the Dutch first army corps (1LK). That prototype, however, also showed that there was a need for a user-friendly, well-documented and maintainable system, using the latest development methods and techniques. 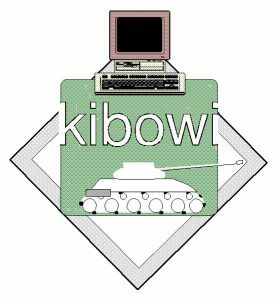 Starting in 1992, KIBOWI version 3.1 was developed using the DOD Standard 2167A for software development according to AQAP quality standards. The system was delivered in 1998. The Royal Netherlands Army signed a maintenance contract for twelve years. In contrast to the traditional command and staff trainers, KIBOWI 3.1 could also be used in a number of crisis management scenarios because four different parties could be defined, each with a different attitude (friend, enemy, neutral) with respect to each other. A position which could change during an exercise. KIBOWI was also used for instructional purposes at the Training Centre Maneuver (OCMAN) for the training of commanders and battalion staff officers and at the Institute Defence Courses (IDL) for use at the division level. In addition, KIBOWI was used for research purposes. From 1996, KIBOWI was also used by several Belgian brigades. In 1998, the exercise of the Multinational Division Central (MND-C), consisting of brigades of England, Belgium, Germany and the Netherlands, was supported with KIBOWI. Between 2002 and 2004, KIBOWI was linked to TNO’s Distributed Interactive Simulation environment, allowing interaction with other simulated systems. KIBOWI was based on a combination of hardware, software and rules for the organisation and use of the system (‘orgware and useware’). The software for KIBOWI was written in ADA. The Graphical User Interface was based on X-Windows with an OSF Motif ‘look-and-feel’ using SL-GMS and Maplink. The hardware configuration for KIBOWI 3.1 consisted of 52 DEC/Alpha workstations with a 21″ colour monitor, mouse and keyboard for the Control Cells, one workstation for the User Interface of the System Operator, and a computer for battlefield simulation. The computers all were part a local DEC/Alpha cluster. In the organisational structure of an exercise, a distinction was made between the players who had to be trained and a control organization that made the training possible, as well as the technical support that made the exercise using computers possible. The players were basically placed in the field with their usual combat equipment and basically had no knowledge of the way they were trained. They had no direct interaction with the KIBOWI system. The technical support consisted of a more or less permanent staff who supported all KIBOWI exercises, provided the instruction of the Control Cells and led the enemy play and the monitor function. The enemy Control cell that controlled the units of the opposing force in the exercise. The Lower Control cells that controlled the units of the battalion, the brigade or the division being trained. These cells acted as a human interface between the players and the KIBOWI system. The Monitor Control cell that monitored the course of the battle and checked whether the practice goals could be achieved. This Control cell could always intervene in the game, for example, to position units or obstacles somewhere else or interrupt combat actions. The cell was in close contact with the leader of the exercise. Selection of the terrain to be used for the exercise; if this area was not yet available (for KIBOWI), this area was additionally digitised on the basis of information from the Netherlands Topographic Service. Defining all units as well as the resources that these units had at their disposal. Preparation: creating the basic situation of an exercise by positioning the units in the terrain and introducing the set-up and obstacles plan. Gaming: the actual exercise with the aforementioned control organisation. Analysis: The evaluation of the battle in a large room on a large screen where an explanation was given by the training staff supported by the Monitor Control Cell. KIBOWI simulated the battle of the entities in a real and detailed manner. The simulation took place according to the time step model, where the time step was adjustable. In principle, time steps of ten seconds were used. The basis for a simulation was the battlefield representation consisting of the terrain (environment (buildings/vegetation), soil mobility (Cross Country Movement), and height (of both ground level and possible constructions/vegetation) recorded per grid element of 100 by 100 meters), roads, bridges, water hazards, slopes and artificial obstacles such as minefields. The visibility conditions and displacements were influenced by the terrain characteristics. KIBOWI was mainly focused on the manoeuvre battle and also focused on the following combat support activities: genius, fire support, logistics, air defence, and air support. The logistics cover both consumption class lu and class V and the recovery of vehicles. In order to be able to play the logistic game effectively, so-called supply points and logistics chains were used, giving the logistician the opportunity to create a chain between sources (supply points or units) and customers (supply points or units or combat units). In addition, the transport of supplies and units was made possible. For instance, if the load capacity of a helicopter was sufficient, it would be able to take an infantry unit and put it back on the ground at another location. Borawitz, W.C. 1989. KIBOWI: A Training Wargame for the Royal Netherlands Army, pp. 198-210. In: Proceedings Twenty-Eighth U.S. Army Operations Research Symposium AORS XXVIII, 10- 12 October 1989, Fort Lee, VA, Volume 1, USA Operational Test & Evaluation Agency, Fort Ave, Alexandria, VA.